· Beautiful 2 bedroom apartment with a glass-enclosed balcony on the 5th floor of an 100-year-old Art Nouveau building, renovated outside and inside. The floors are still the original colorful mosaic, and the ceilings are 9 feet high. There is an elevator, air conditioning, central heating, and a full kitchen with granite countertop, pots & pans, dishes, etc. One full bathroom with toilet, sink, and half-tub with shower. The living room has a dining table and chairs, a sofa, a 21-inch TV, DVDs, etc. You can see the tips of La Sagrada Familia from the enclosed balcony. The apartment fits one to four although an occupancy of three-maximum four would be the ideal for the size. In case your dates are not available in this apartment, we have seven other 2 bedroom apartments in the same building. Please see our other VRBO ads or our website. There are many cafes, restaurants, tapas bars, and shops in the neighborhood also. The 115-year-old Market of La Concepció, where you can do your grocery shopping in a traditional setting, is just 200 meters from the apartment. This market has fresh meat, fruits & vegetables, cheeses, etc. as well as a florist and a grocery store with a good selection of local wines. The Eixample is recommended as a convenient location to see all the different sights around the city, but not as crowded as the Old City. You can get a taste of real local life. · There is a bus stop on the corner right by the apartment that will take you to almost all the places of interest in the city, if you don't feel like walking. The city buses are nice and modern, and run often. The apartment is also less than 5 minutes walking from the metro station of Verdaguer, on both the yellow and blue lines. The upscale shopping street, Passeig de Gracia, is just 1 stop away, though you can easily walk there from the apartment. Plaza Catalunya (the very center of the city and also walkable) and the start of Las Ramblas is just a 6 minute metro ride away, and the beaches are just a 10 minute ride. There is also a parking garage close to the apartment, although renting a car in Barcelona is not recommended. I loved my stay at this apartment in Barcelona. 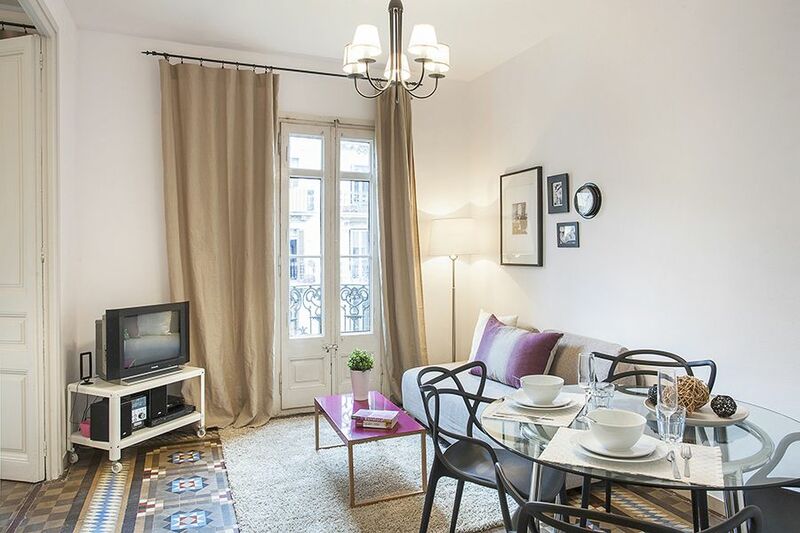 It's a close walk to attractions like La Sagrada Familia, Gothic Quarter, and Arc de Triomf. It's also close to bus lines and easy to get a cab to anywhere in the city. There are also great restaurants and bars nearby. The apartment was clean and comfortable. I enjoyed the enclosed balcony since it's still pretty cool in the evenings. I'm a woman who visited Barcelona alone and the apartment and building were very safe and secure. The tub was very small and some instructions on how to use the washing machine/dryer would have been helpful, but overall I thoroughly enjoyed my stay and will book again on my next visit to Barcelona. Great location and a cheerful greeting. Clean and comfortable . Would return again . Perfect location, close to everything, especially Sagrada Familia that we went back twice to see it. We walked all over Barcelona from the apartment including Park Guell which was about 30 mins and Las Ramblas. The apartment was cozy and clean. The owner and staff were very responsive and accomodating. There are many nice and local restaurants and boutiques within 3 minute walk of the apartment. I would definitely stay here again and recommend it to my friends and family. Nice apartment in great location-- very near Sagrada Familia. Great location near metro stations, restaurants, bakeries and very near La Sagrada Familia. Decent apartment and very helpful and responsive hosts. Bathroom and kitchen areas are small, but manageable.